30 degree - Substitute for Ioline #106988-30 degree plotter blade. 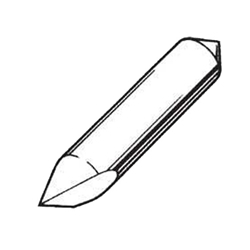 For best results, use this blade angle when cutting material with a 2-6 mil thickness. 45 degree - Substitute for Ioline #106989-45 degree plotter blade. For best results, use this blade angle when cutting material with a 6-12 mil thickness. 60 degree - Substitute for Ioline #106990-60 degree plotter blade. For best results, use this blade angle when cutting material with a 12+ mil thickness.